I Love Burgers at the Palazzo was my 5th stop on the Las Vegas Burger Tour. I was just coming off of the high from the great burger that I had discovered at KGB Burgers, and I wondered if I Love Burgers would stack up favorably. I had occasion to speak with recently hired Executive Chef, Adam Crisafulli. Adam’s background was in Italian fine dining. The congenial, new chef had made it his mission to make everything at the relatively new I Love Burgers just a little better. He introduced a proprietary bun, a proprietary French fry, and a proprietary seasoning blend. I Love Burgers was all about taking comfort food to a new level, and the menu contained plenty of interesting items in that vein. In particular, the Blueberry Panshake and the I Love Bacon Burger took that comfort food theme to exceptional heights. I ordered a burger, The Standard, which was the $10 lead item on the menu. The Standard came with cheese. Fries were extra. My burger arrived in about 10 minutes. The Beef: The beef at I Love Burgers was Certified Angus, 80:20 Chuck. This Chuck had been wet-aged for 21 days and then ground in-house. This was the most interesting Chuck that I had encountered. The funk from the aging carried as a single note through the entire bite, but it was muted enough that it was not a distraction. That aged note blended into what must have been mesquite (???) seasoning, and the impression on the palate was subtle bacon, and that was very satisfying. I did check with the kitchen to make certain that they didn’t just cook the burger in bacon grease. There were no notes of blood or minerals, and the bite was moderately beefy. The mouth feel was altogether satisfying. The juicy Chuck was coarsely ground and firmly packed so that it delivered a satisfyingly dense, resilient, but not chewy, bite. The beef was unusual, but I kept coming back to it, because it was so interesting. The Seasoning: Chef Crisafulli left the interior alone, but the exterior was nicely seasoned with a proprietary blend of seasonings. The seasoning was appropriately salty and evenly applied. This caused the beefiness of the Chuck to rise to the surface during the course of the bite. The Sear: A competent sear was applied to the patties via the expansive, gas-fired flat-top. The sear further concentrated that spice blend and the juices from the beef. The patty was relatively thin, so a really crusty sear would have been very difficult to achieve, but this one did the job. In the case of I Love Burgers, this sear made sense when one took the bun into account. The Preparation: This was meticulous at I Love Burgers. The Executive Chef had his hand in everything, and the cheerful staff all expressed pride in their work. In particular, the Shake Master (Corrie), was on her game the entire visit and made some spectacular dessert drinks. The burger came out at the requested Medium cooking temperature—this was the recommendation of the house, and it made sense. I wanted a Medium burger so that the collagen in the Chuck would add flavor. The Cheese: The American cheese worked its usual magic. It added creaminess, savory, and umami to the dish. This complexity was welcome as it added some nuance to the steady bacony note from the beef. Cheese AND bacon—nice. The American cheese was one of 12 cheese choices. The Bun: The bun was a yeasty revelation. This was a flat brioche, which was delivered fresh, daily from a local bakery. It was prepared to the specifications of I Love Burgers. The cut surfaces of the bun were brushed with mayo butter and then toasted. The point of the mayo butter was to contain any stray juices from the burger. This also added a pleasant note of richness to this component. The bun was completely and utterly delicious. I ordinarily do not give a lot of thought to burger buns, but this was a bun that I sought out during each bite. It was especially tender. The top of the bun was glazed with something sweet—this caused each bite to lead with a hint of sweetness—that sweetness combined with the cheese and beef flavors was exceptional. The bun was also satisfyingly yeasty. The bun instantly reminded me of the German Yeast Dumplings (Hefekloesse) that my grandmother would make as a treat when she visited us in the U.S. Talk about comfort food! The Meat To Bun Ratio: This was perfect. 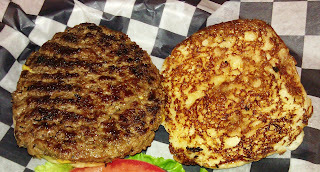 The flat bun was ideal for the flat patty, and the first bite was identical to the last. The Fries: These were absolutely spot-on in the seasoning, crispness, and color. 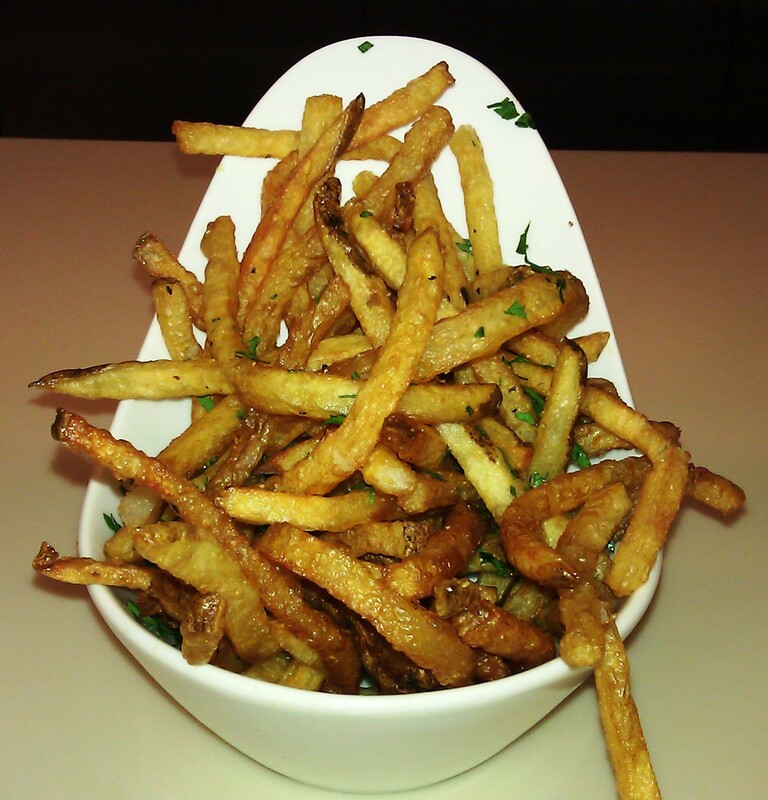 The bespoke, shoestring fries were cooked in canola oil, and they remained crisp even as they cooled. The Toppings: The vegetation was fresh and crisp. Frankly, I was so blissed out by the meat and bun that I gave little though to the toppings on the side. There were also about 20 sauce options on the menu, and the topping list was extensive, as well. The Value: It was a tremendous value. The I Love Bacon Burger: I tried a small portion of the house specialty I Love Bacon Burger. I was a little dubious, since I had recently had a less than awesome experience with a similar dish. In this case, however, the bacon was cooked off and chilled prior to being ground into the beef. Here is where it got geeky. The chef used a very particular cut of beef for just this burger. It was the teres major. This muscle only weighs about 4-6 pounds in a full grown cow, and it is part of the Flat Iron steak complex. It was highly flavorful, and it needed to be to counter the potent apple wood smoked bacon. 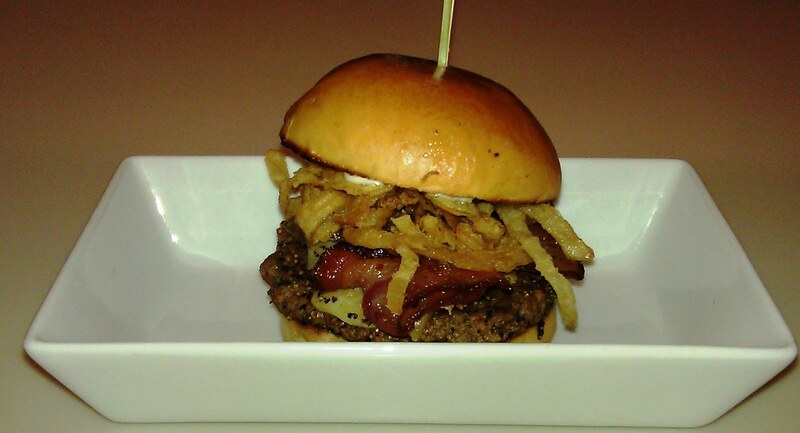 The hybrid patty was topped with Smoked Gouda, fried onions (breaded), bacon mayo, and MORE BACON. This burger was simply the best breakfast that I have ever had on a bun. I am grateful that I did not order the full portion, because the small portion was impossible not to finish. So good! The Shakes: Corrie, the Shake Master behind the full bar, was terrific with flavors and textures. She brought out a remarkable concoction known as the Blueberry Panshake. It contained chopped pancake, fresh blueberry puree, maple syrup for starters. This shake was the best breakfast that I have ever had in a glass. It was remarkable and instantly satisfying. It didn’t stop there, though. On that day, she had just created a Birthday Cake Shake. This contained chopped Twinkies and frosting. This shake forced an instant smile to my face. It was clever and delicious. The shakes added a carnival element, which perfectly coupled with the rich and satisfying burgers. Rich, satisfying, familiar, inventive, delicious, and welcoming were all words that sprang to mind as I reflected on the dining experience at I Love Burgers. It was a perfectly decadent detour, which I would gladly take again. Great care was taken by an enthusiastic and talented team to prepare some of the most satisfying fare that I have tried. They delivered happiness on a bun and in a shake. Burger Review : This was the best burger in Las Vegas in terms of delivering happiness and comforting satisfaction.